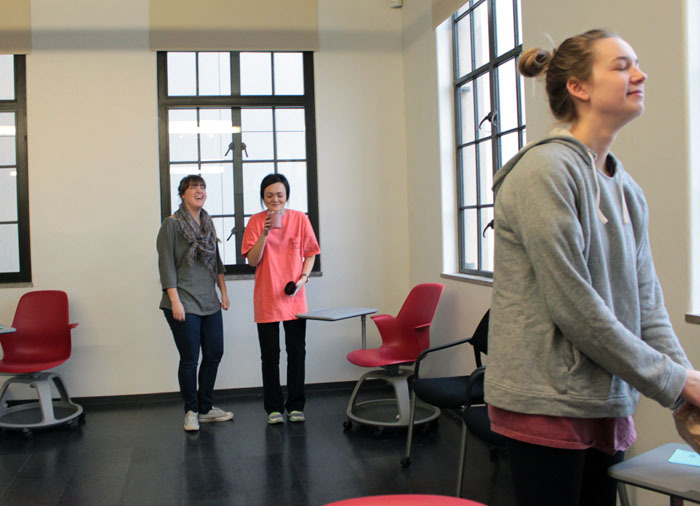 Interior design students recently explored the environments they inhabit through some sensory activities. 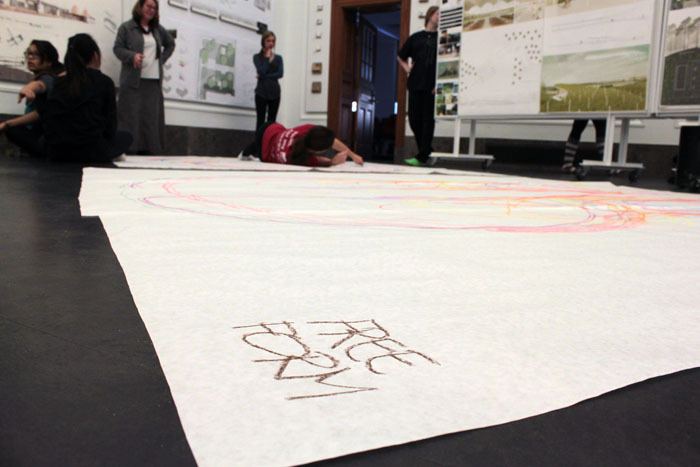 Last week, Jennifer Webb invited her third-year interior design students to use their senses to explore the spaces they inhabit in a creative way. Human senses and movement through space evoke memories, contribute to our knowledge and understanding of place, and create rich and fulfilling experiences. The activities she planned for class were to develop students’ awareness of the environments around them. Webb ordered a pack of colorful Conté sticks, or crayons made from compressed powdered graphite or charcoal mixed with a wax or clay base. The sticks are squared off rather than rounded like other crayons. She also ordered big rolls of butcher paper and taped 9-foot strips together, making a space big enough for students to lie on the floor and stretch out on. One morning, one by one, her students used their own color of crayon and made designs on these large patches of paper. They stretched their arms above their heads, and drew a big circle as they pulled their arms down by their sides, mimicking Leonardo da Vinci’s Vitruvian man. Then, they each placed a crayon under a socked foot and pushed it in a curved line. This exercise showed their range of motion and how their bodies can fill a space. 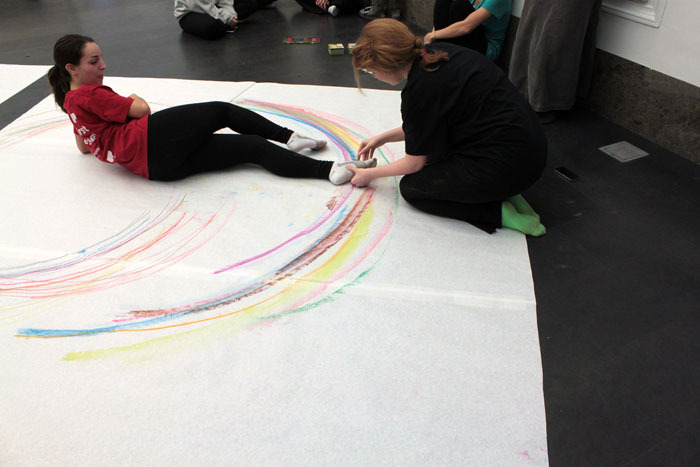 Interior design students express the movement of their bodies through space using colorful Conté crayons. 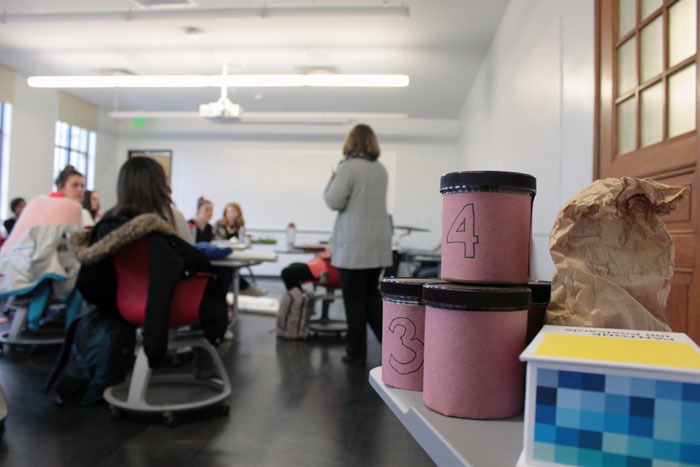 Another morning, Webb placed containers and paper bags around the classroom, and let the students investigate the contents of these for their feel and scent. Afterward, she asked them what they thought they were feeling and smelling, and they talked about the emotions and thoughts evoked by each. Cotton balls, for instance, spurred them to think of comfort and safety. The glass sphere paperweight triggered cold, uncomfortable, uninviting thoughts. Gum balls, the opened fruit that fall from sweet gum trees, were dry and rough. Webb said those could be compared to the feeling of textures found in the built environment, such as brick, textured concrete or metal mesh. Scented lotions and creams fondly reminded them of family members, while cinnamon made them think of cookies and lattes. Students investigate the smell of contents in containers and the texture of items in paper bags. Our experience of space is more than visual, and Webb said she hopes these exercises will achieve two things. First, she hopes students will think more comprehensively about their design solutions and take advantage of these rich sensory opportunities. She also hopes students be more aware of the spaces they each inhabit and their impact on emotion and memory.